Talkie Walkie is a mic minigame in Mario Party 6, the name is a pun on a "Walkie-Talkie". 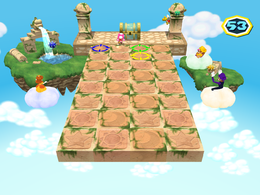 The objective of the mini-game for the solo player is to reach the Treasure Chest up ahead, while the group players' objective is to prevent the player from reaching the goal; all this within the time limit of sixty seconds. A single player has to shout commands for the character to move, while the other three players try and throw Spinies at the solo player. The solo player win if they reached the Treasure Chest at the end. 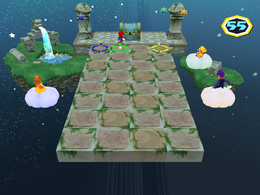 The group players win if they manage to hit the solo player with a Spiny, the time limit reaches zero, or when the solo player falls off from the stage. Rules – "One player speaks commands to reach the goal. The other three will try to hit them with a Spiny!" Advice 1 – "The solo player should watch the other players' cursors to know where to move next." Advice 2 – "The solo player can't take orders while moving. When your character stops, speak another order into the Mic.'" This page was last edited on January 16, 2018, at 14:23.